There are two fundamental points to understand about outdoor lighting. The first is that we actually require much less light in outdoor living situations than indoors, which means the overall lighting can generally be more theatrical and less focused on tasks. The second is that in lower ambient light situations, we actually prefer lower color temperature light (warmer); it’s actually visually more comfortable. Whether it’s our primal draw to the flickering flame of fire or the fact that warm light renders the skin so naturally, our outdoor design objective is to aim for low, warmly toned lighting levels. The Lantern Effect - using a structure's glazed walls to provide ambient light to nearby exterior spaces. 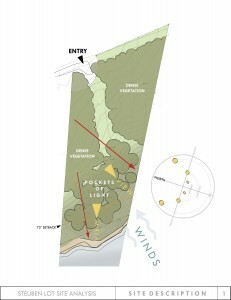 Layering of light - ambient, task and accent light tips. I've recorded a two-part video describing in more detail the process of siting my own home, a modern longhouse. This expands on some of the concepts presented in my previous video post and supports it with a real world example. There are a couple of important points that I didn't get to in the video. First, the idea of a modern longhouse was a derivative of the site, it wasn't a preconceived strategy. However, having used this plan I can see merits on many different types of sites, it's a versatile and economical plan to construct. 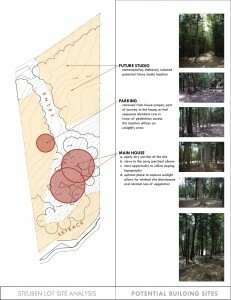 But, back to the idea behind the longhouse concept. The swath of fallen birches, the proximity of neighbors, the solar aspect and the surrounding forest suggested a longer house to exploit the variety of textures surrounding us. We adopted the idea of a longhouse for three reasons: one because it was an historical archetype of Native Americans that settled here long before we did. Two, because the idea of the longhouse suggested a simple (and affordable) way to unite a family under one roof, the original longhouses housed up to 20 families under one roof. And, three because it suggested more broad site connections to the swath of fallen birches we were clearing away to make our home. As I said in the video, I'll be using our longhouse as a teaching tool in future videos and posts...stay tuned. If you haven't looked over the portfolio images yet they're located here. Please leave a comment below or feel free to contact me at eric@thirtybyforty.com with any questions.